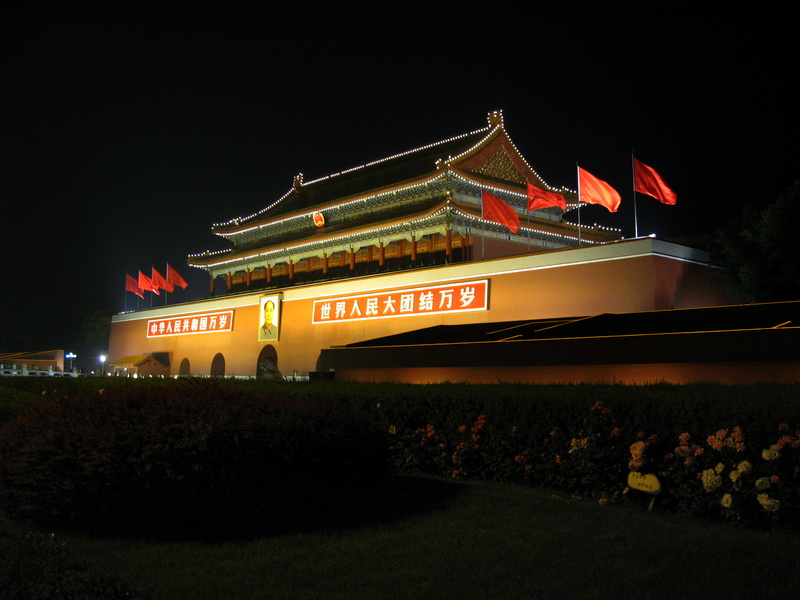 I have been to China three times. 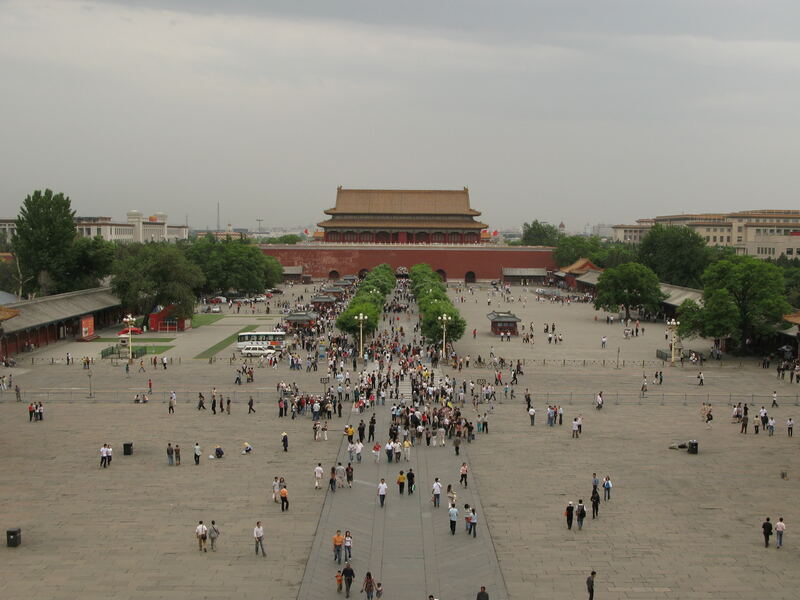 The first thing I did upon my first visit to Beijing was make a beeline to the main (south) entrance into the Forbidden City, the Gate of Heavenly Peace. 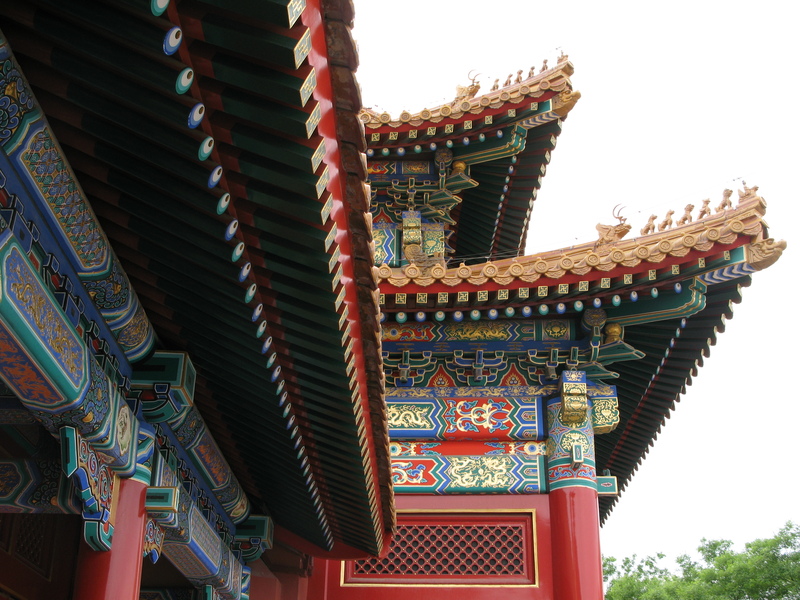 Although I wish I would have been able to capture the color of the flowers in the foreground, the imposing entryway in the background, awash in imperial red, made quite an impression. Just inside the Gate of Heavenly Peace entrance the following morning, looking south. 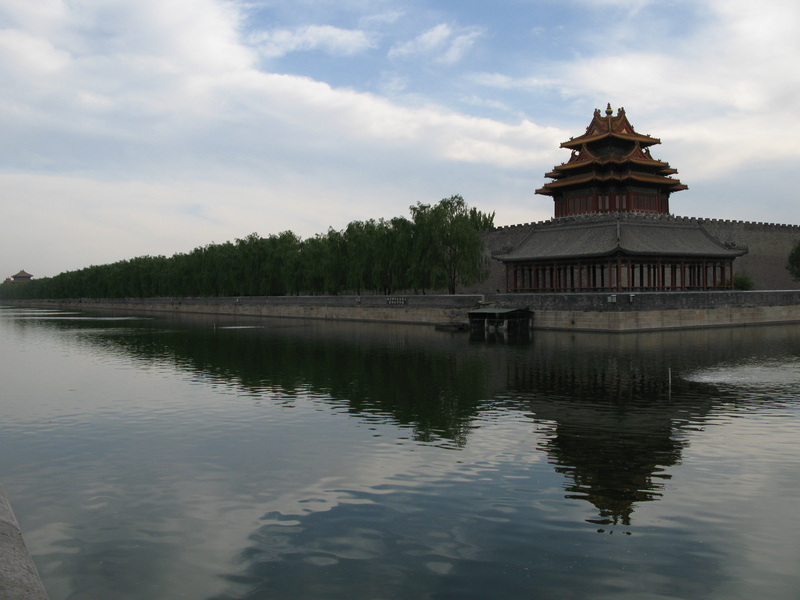 This section of the Forbidden City is separate from the main complex by yet another wall, and many visitors on a tight schedule never journey any farther into the Forbidden City. They don’t know what they’re missing. 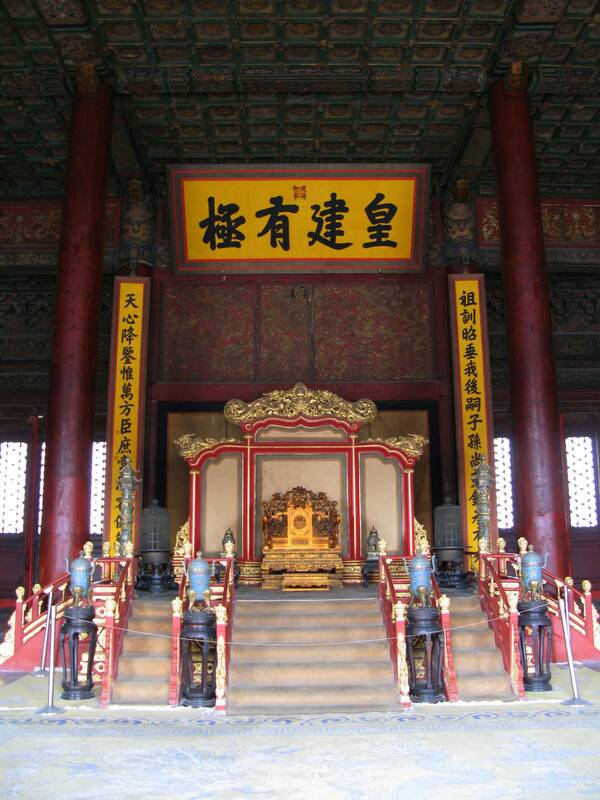 The throne room. Use of flash may have produced a better color scheme, but flash was prohibited here. Nothing great in terms of composition, but the muted sky (it rained briefly during my visit) brought out the vibrant blend of reds and blues surrounding this terracotta roofcomb. 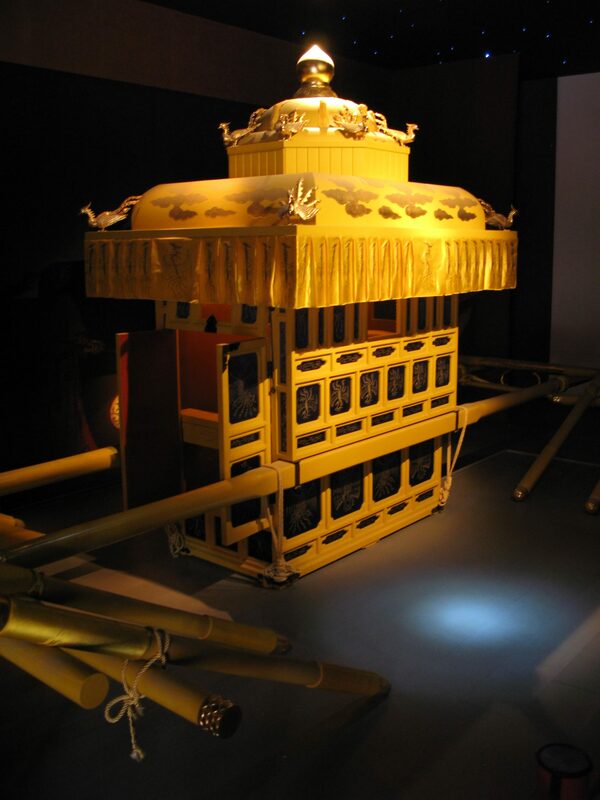 Many rooms along the east and west walls function today as museum galleries housing various imperial accessories, such as this portable carriage, used by eunuchs to ferry the emperor anywhere he wanted…so long as it was within the palace walls – as far as he was allowed to go. 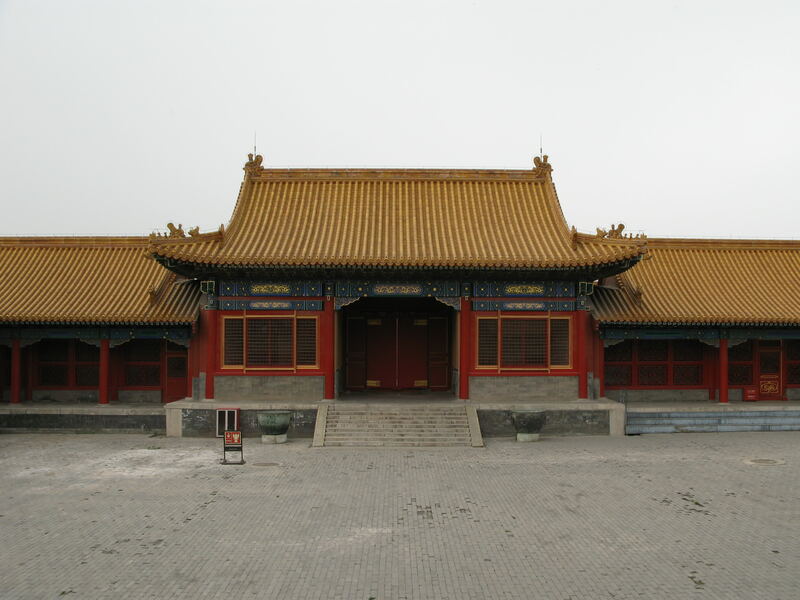 Although the Forbidden City is Beijing’s top tourist attraction, its sheer size makes it easy to still have quiet corners to yourself, such as this lesser courtyard. 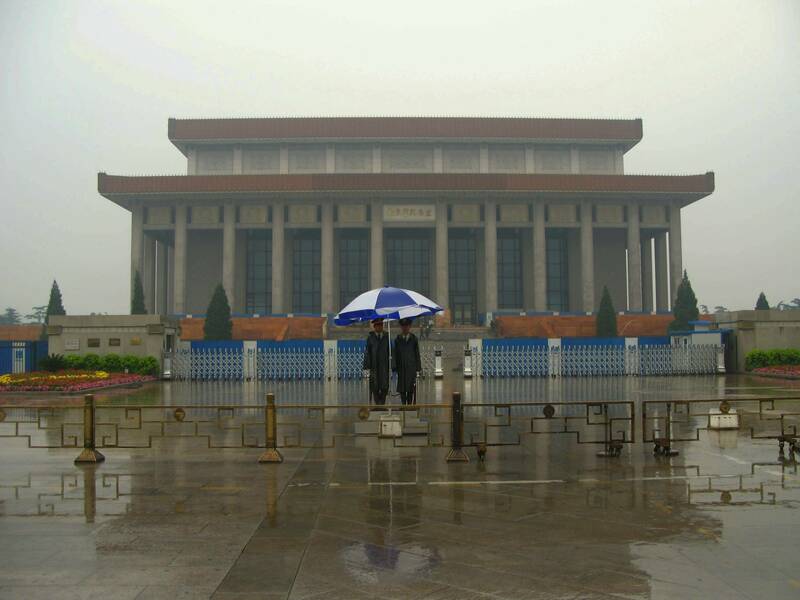 I do not recall what was originally housed inside the building pictured above. 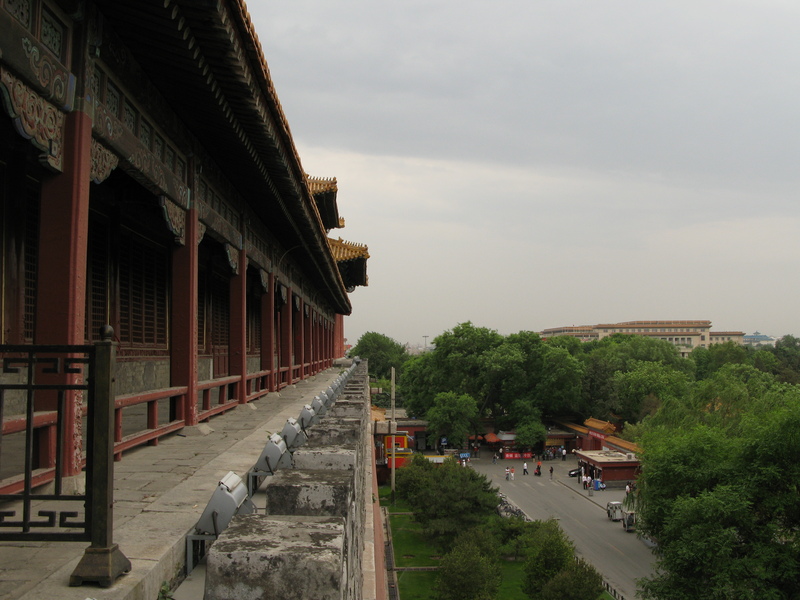 The sky cleared up later that afternoon and I made my way north, my goal being to circumnavigate the moat that surrounds the Forbidden City. 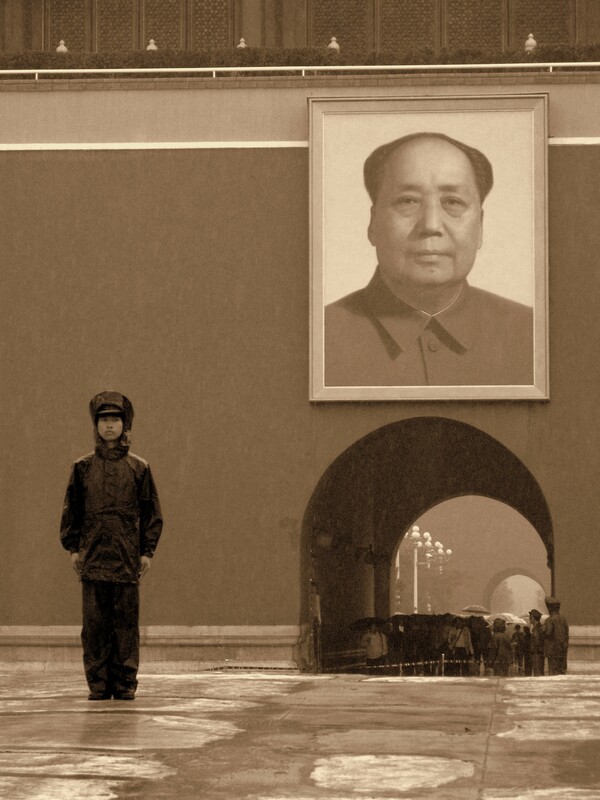 I rather like this picture and its symmetrical reflection. 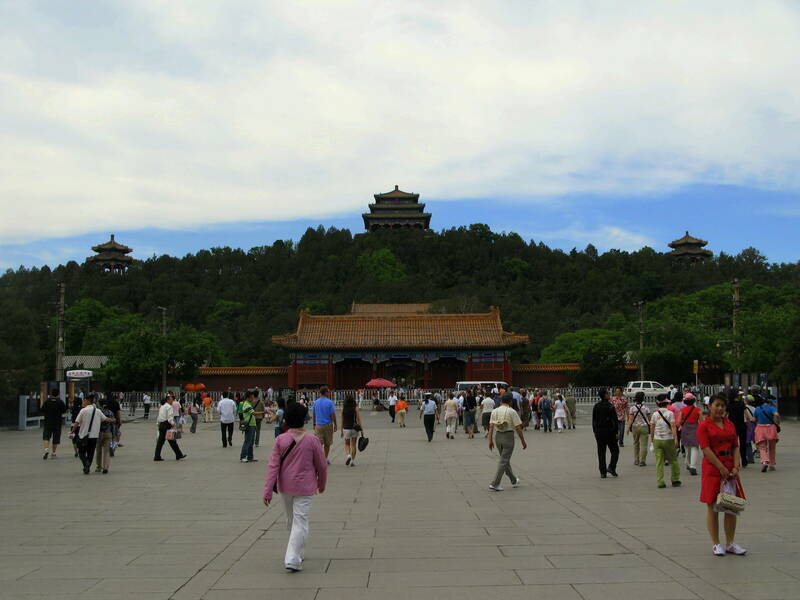 The temple-like buildings on the artificial hill above are not part of the Forbidden City. 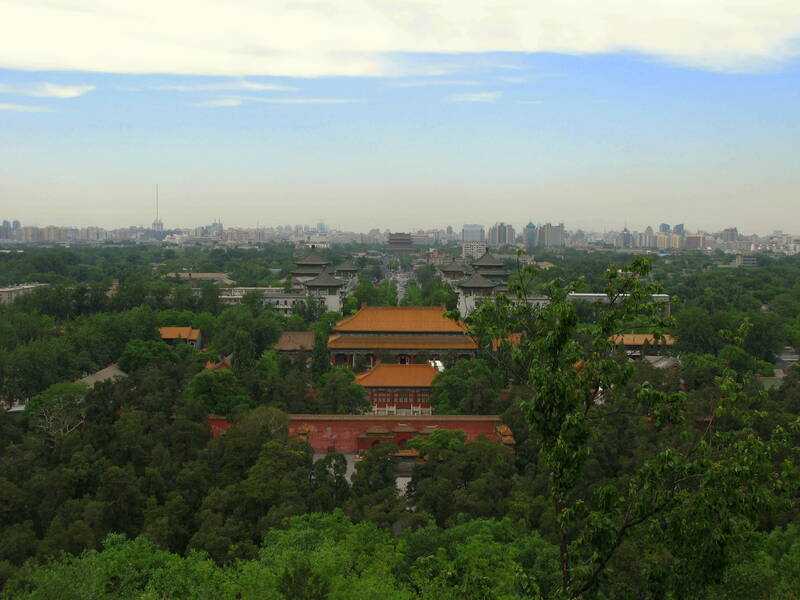 Rather, they adorn Jingshan Park (Prospect Park), which attracts locals and tourists alike for its views over the palace complex. Not bad, eh? 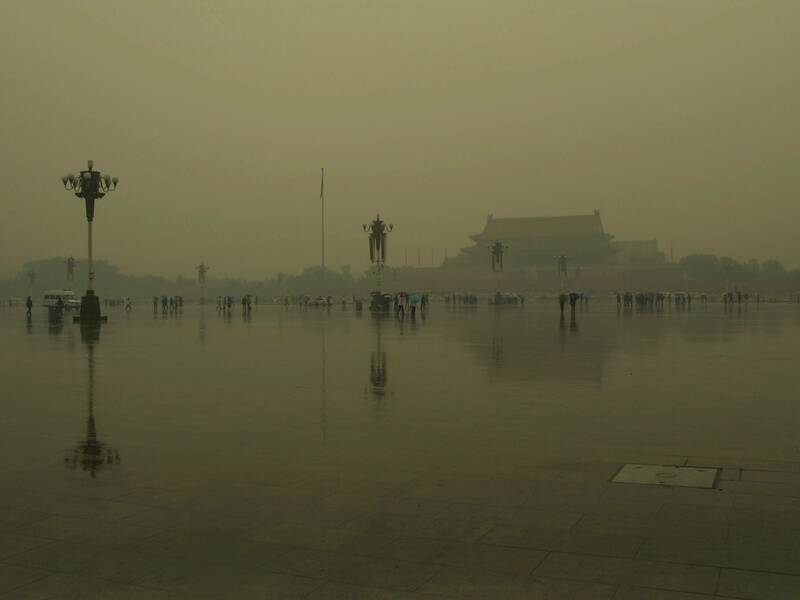 Pity about the smog, though. 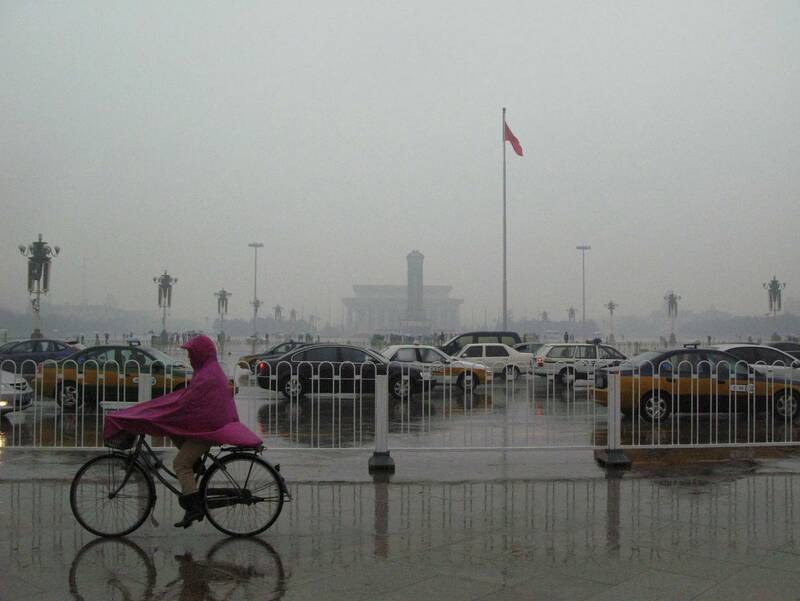 …while my first visit to Tiananmen Square was doomed with rain, making the city’s smog worse, not better. The sentries above stand guard in front of Chairman Mao’s mausoleum. He was “on vacation” during both visits to the square, presumably getting a fresh formaldehyde treatment. 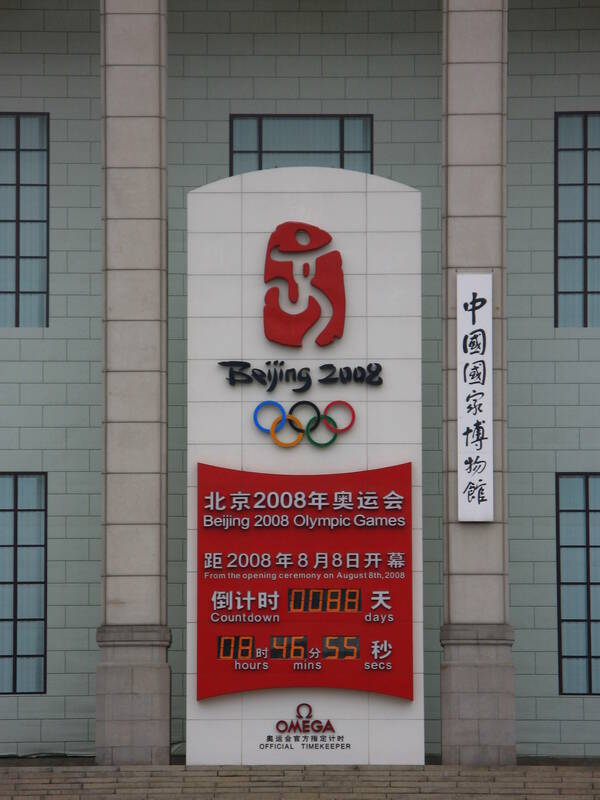 Beijing 2008 Olympics countdown clock. My second visit to the city took place less than three months before the Olympics, and in retrospect, I wish I would’ve made it to the Games themselves. Not a great composition and taken on the fly, but that pink poncho brought life to the otherwise colorless picture. 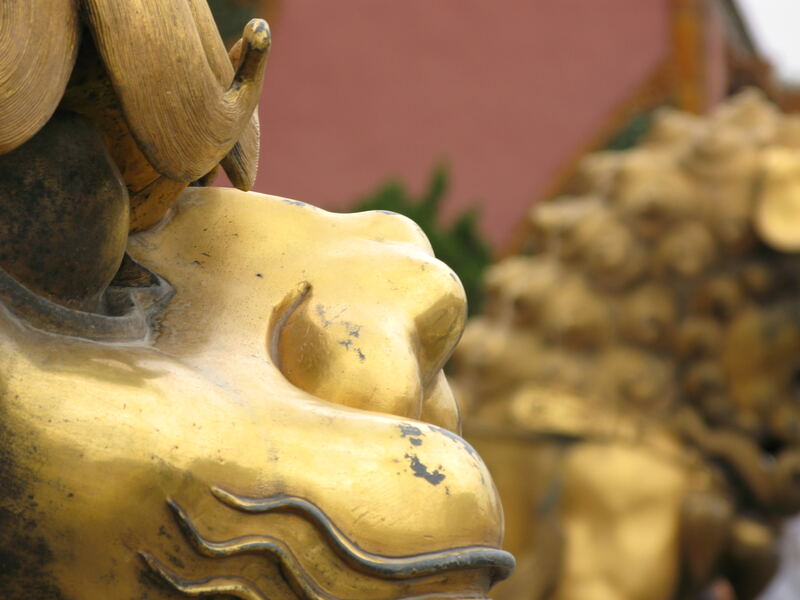 Speaking of colorless, the sepia tone edit above, taken moments later at the Gate of Heavenly Peace, is one of my favorites from the trip, and was featured in my recent People around the World: Asia post. Here is the original image, which better shows, I think the rain pouring down in torrents. Which version do you like more? 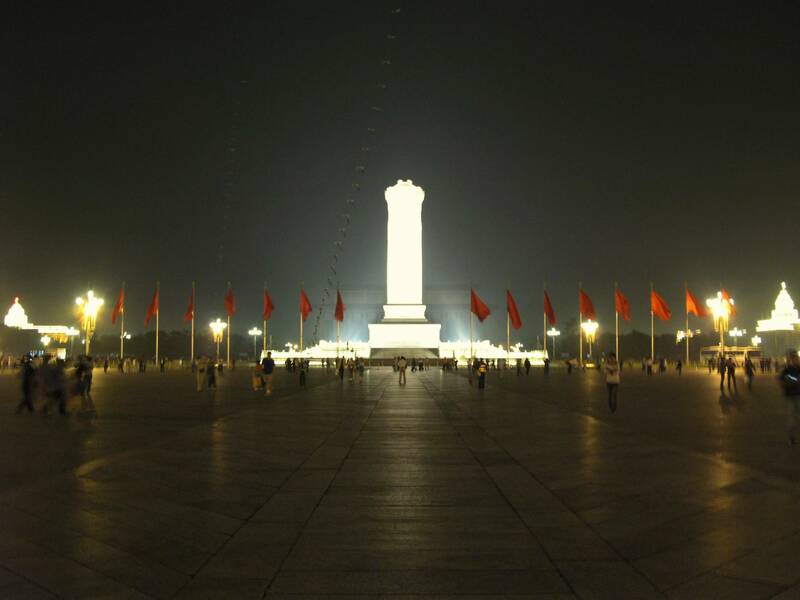 Last night in Tiananmen Square, facing the Monument to the People’s Heroes. 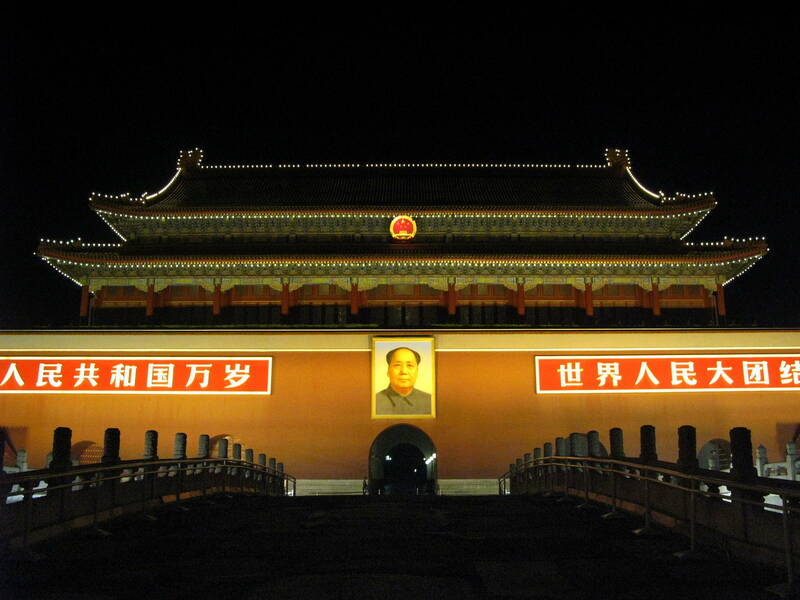 It was here that Chairman Mao proclaimed the founding of the People’s Republic of China, in 1949. 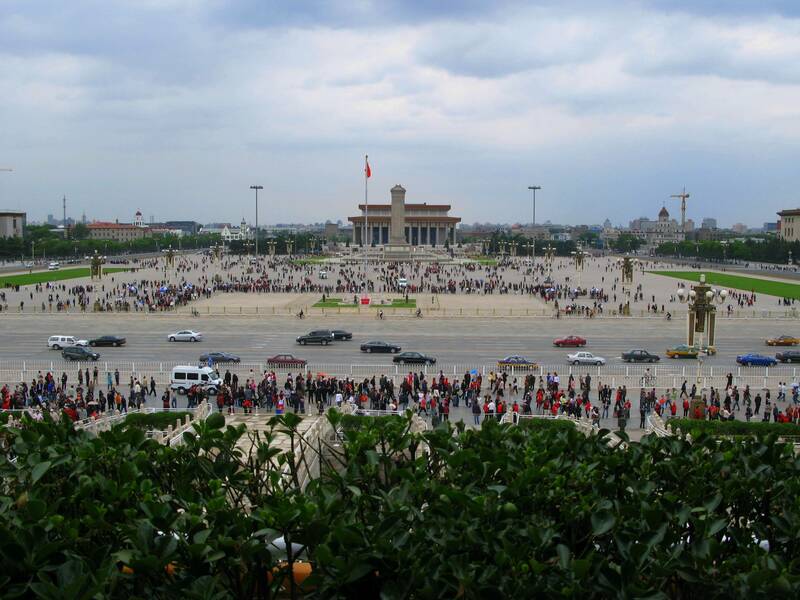 It was here, 50 years later, that tanks suppressed a pro-democracy student demonstration. 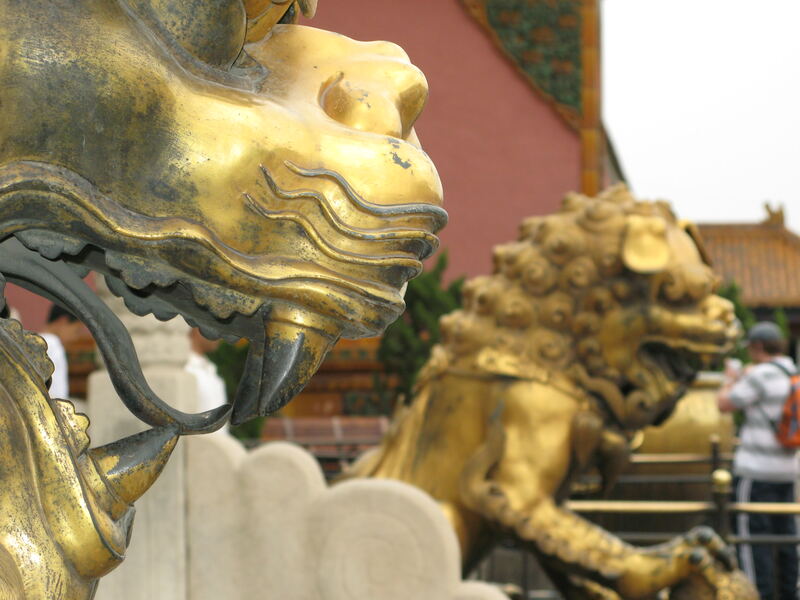 And it is here – and across the road in the astonishing Forbidden City – that you can walk in the steps of history…and hear ghosts tell a thousand fascinating tales. Go.